Around the Spiral with Edward Lifegem: Pirate101 Contest! I hope you're having a great weekend so far. I have missed you! I hope I can make more Pirate101 related blog posts soon. I have been so far behind on homework up until recently. I'm now just catching up on everything. It's already been nearly a month since I made my last blog post... I think it's time to start catching up on posts. I decided to buy a few gift cards and have a little raffle since it has been awhile since I had my own Pirate101 contest! :D If you win, you can save the cards until Pirate101 releases a new world, or just use them to level that new character on your second account. :) #Pirate101Lives! IF you use the Pirate101 comment option, don't spread hate. Everyone reading this post should be a fan, right? If you're not, Pirate101 isn't the game for you. I'm having this contest to thank everyone for all of their support! :) Not for hate. My favorite thing about Pirate101 is collecting the different ships. My favorite thing about Pirate101!? Hmmmm, it's probably the storyline! I just love how we have travel to different worlds and take out Kane's elite Court by destroying each of the most dreadful members of the Armada! In my opinion, I even believe it's better than Wizard101's storylines! I love the idea of companions and how they can be used to allow a person to play a really hard battle when they can not get anyone to help them out in a pinch. Thanks for the Contest. My favorite thing about Pirate101 is the Skyways. They are absolutely beautiful. So many things... boss gear is great. Powers are great. Classes are so much more diverse. The best thing probably has to be the battle system... they've barely scratched the surface of what they can do with battleboards. My favorite thing about Pirate101 is flying in the skyways! The thing I like most about Pirate101 is the combat. It's completely different from Wizard101 and makes you think a little bit more about it. Also, the Companions! I don't know why but I love the fact that they are always following you and help you out. My favourite thing about Pirate101 is the tactics-type gameplay and the skyways, and the ship battles. My favorite things about Pirate has always been the fighting style and the different strategies I can come up with. 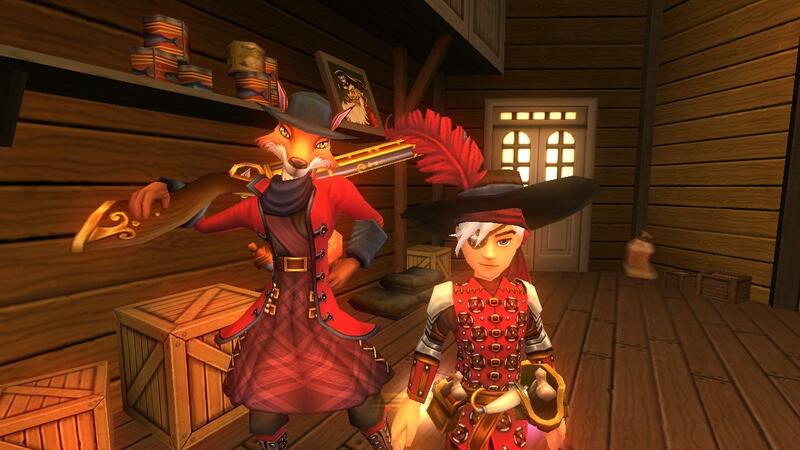 My favorite thing about Pirate101 is the unique combat style as well as getting to customize my character. My favorite thing about Pirate101 is the gameplay which bears a resemblance to playing chess! I personally love chess and play chess in my leisure time. Instead of moving inanimate chess pieces along the board, you can actually control the abilities your companions will be using in Pirate101! I guess I love all the different worlds in the pirate101, from Monquista to Valencia and everything in between. I also love the cleverly written story. Now that my best friend from Wizard101 plays Pirate101 too, I've been having a blast running a second swashbuckler through the game with him! I love the story line and the theatrical elements. And I LOVE Moe! My new swashbuckler is my first character with Moe and I LOVE LOVE LOVE him!